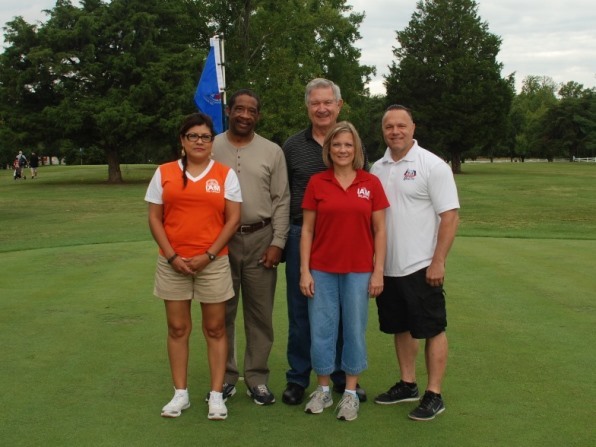 Pictured left to right, IAM General Vice President Dora Cervantes, IAM General Secretary-Treasurer Robert Roach, Jr., retired IAM District 142 General Chair Bob Bax, IAM Education Representative Julie Frietchen and IAM District 15 Organizing Director Vinny Addeo on the green at the Robert Roach, Jr., Invitational Golf Tournament to benefit Guide Dogs of America. Dozens of IAM members, leaders and friends gathered for a day on the golf course at the Robert Roach, Jr., Invitational Golf Tournament to benefit Guide Dogs of America (GDA). The event, held on the nine-hole golf course at the IAM’s William W. Winpisinger (WWW) Education and Technology Center in Hollywood, MD, raised nearly $18,000. Watch “Golfing for Guide Dogs” on the Machinists News Network. 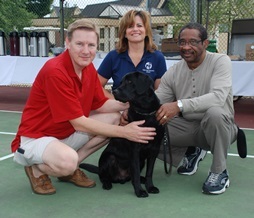 Pictured left to right, William W. Winpisinger Center Director Chris Wagoner, Guide Dog of America Canine Development Assistance Yvette Sheehan, and IAM General Secretary-Treasurer Robert Roach, Jr. with guide dog Trader at the Robert Roach, Jr., Invitational Golf Tournament to benefit Guide Dogs of America. Two-year-old guide dog Trader and GDA Canine Development Assistant Yvette Sheehan were on hand for the special event, educating players and volunteers on the selective breeding and training techniques that go into preparing a dog to one day guide a blind recipient. Guide Dogs of America was founded in 1948 by a retired Machinists member dedicated to helping visually-impaired Americans like himself receive a guide dog, free of charge, in order to live a more independent life. The IAMAW remains a key supporter and staunch advocate of the school’s mission today, says WWW Director Chris Wagoner. IAM General Secretary-Treasurer Robert Roach, Jr., applauded the IAM’s longstanding support of GDA and says he’s proud to lend his namesake to such a great cause. The tournament included door prizes, a 50-50 raffle and a closest-to-the-pin contest. See photos on the IAM Facebook page.